The self organization of hams, and perspective hams, is a beautiful thing to watch. While waiting outside for instructions, everyone is politely engaged in conversation about their desired outcome and why they embarked on the ham radio adventure. It was a great opportunity to connect and get some of the nerves out. The Volunteer Examiners were polite, funny, and professional. I noticed that there was a seriousness in the air that said “we want you all to have a good experience, but we take this seriously, so don’t mess around.” This is my kind of community! The efficiency in which they took to getting us all prepared and testing was very smooth. The whole process was as simple as it should be: sit, fill in papers, take the test, fill in papers, done. I could have been in and out in 30 minutes. After finishing the exam, they graded the test right in front of me within a minute. I was glad to see that I had only missed two questions and passed. 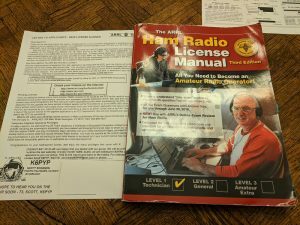 The ARRL Ham Radio License Manual: Great resource to go in detail and learn why somethings are set up the way they are. HamStudy.org: I only used this for practice tests a few days before the exam; although, I will use it more for the General class exam prep. I learned a ton of practical knowledge from my studies that I can’t wait to put to use. I also found Dave Casler’s YouTube helpful. I’ve started studying for the General exam, so as I find useful resources I will post updates. After I get my call sign, I hope to be done with my transmitter build, so I can get on the air. Over the next month, I will be building a shortwave radio, field strength meter, power supply, mic pre-amp, and transmitter. 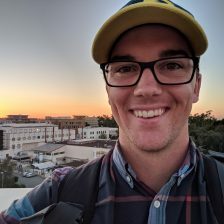 I’ll be posting YouTube videos for each step, and I’ll write up as much information as I can so you can do them as well if you like. Congratulations on a job well-done, and welcome to Amateur Radio!